G.I. Joe FSS 7 Dreadnok Kaos slashes your expectations! The G.I. Joe Collector’s Club has dropped another FSS 7 preview: Dreadnok Kaos! Ladies and Joe fans– feast your eyes on Jason Voorhies! Um…. I mean… Dreadnok Kaos! All kidding aside, this figure has been on some fans’ “most wanted” radar ever since his first reveal as part of the Concept Case from Joe Con 2012. He’s got a very Dreadnok look with the rugby/web gear from the 2011 Thrasher (or “Thunder” as Hasbro dubbed it) and the Road Pig crossbow that was finally released as part of the Danger in the Docks set. The original Dreadnoks were inspired by the Marauders in the Road Warrior and this design is in keep with that aesthetic. Have you figured out the G.I. Joe 2016 lineup yet? Who will be included in the G.I. Joe 2016 lineup? We’re just a few days away from the Hasbro panel at Joe Con 2016 in Loveland, CO and that means we’re just a few days of way from discovering what exactly is the G.I. Joe 2016 line-up of figures. On June 3rd, those clever marketing devils over at Hasbro published a crossword puzzle at Hasbro Pulse. This matrix was comprised of all of the figures to be released by Hasbro in the G.I. Joe at Toys R Us this year. However, the kicker was that there were no clues given. 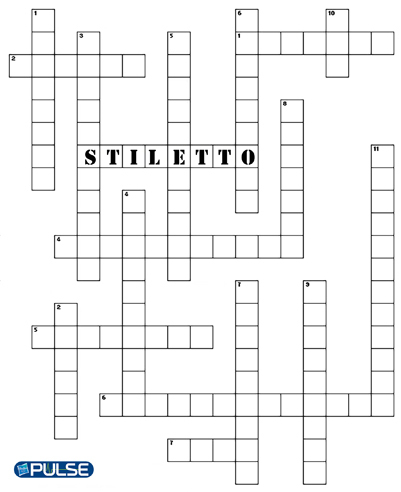 Only one row was filled in and that was the name of the Kindle World’s Fan’s Choice character Stiletto. The G.I. Joe Collector’s Club rounds out the week with another preview of Figure Subscription Service 3.0. As you get ready for the weekend, feast your eyes on Hit & Run! You could have heard the collective gasp from the fandom when the G.I. Joe Collector’s Club announced that Hit & Run was going to be included in FSS 3.0. Based on his appearance from the Concept Case as revealed at Joe Con 2012, this figure instantly became one of those “lost gems” that many fans wanted simply because he wasn’t scheduled for production. It was ironic considering that Hit & Run never had much of a presence in the original G.I. Joe line outside of his vintage 1988 version. It wouldn’t be until 2009 when fans would receive a 25th Anniversary version as part of the Assault on Cobra Island 7 Pack with a second generation 3 release that was based on a cancelled vintage vehicle driver as part of the 2013 Joe Con Nocturnal Fire set. The convention version was met with some controversy due to the color deviance from the original ’88 version and so it seems the G.I. Joe Collector’s Club is taking one last shot at giving members the Hit & Run they asked for. 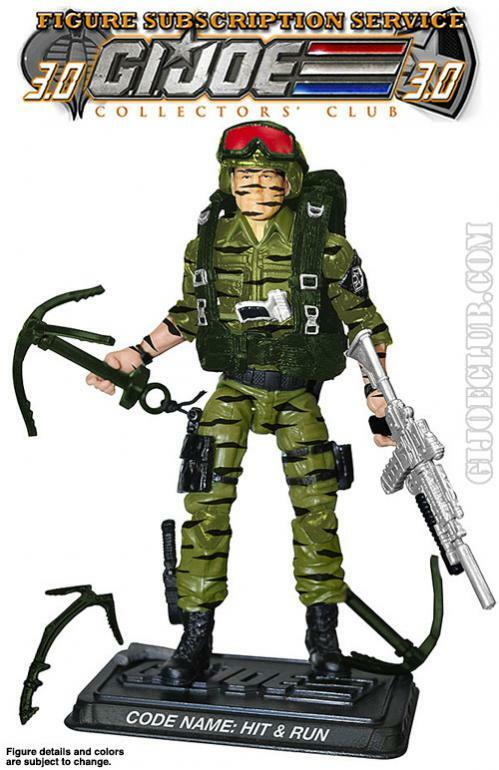 The FSS version appears to be straight out of the concept case and essentially replaces the 2009 version as a modern interpretation of the character. All the signature elements are there– including the missing camouflage on the figure’s face– something that was noticeably absent in the Nocturnal Fire version. The base green color is gone– which is most likely a cost-savings issue in terms of paint apps but overall the look of Hit & Run is still there. (Since this is a recoloring of the same version that was in the Nocturnal Fire set they’re using the same paint masters for the head and just adding in the striping.) While he doesn’t have his duffle bag, it’s not a deal-breaker for me and I find that this version will easily replace the 2009 release in my collection. Photonut is on the scene and been providing pics when he can. (Plus, the admin is a bit late in getting these posted.) Friday Hasbro unveiled part 1 of their “Vault”– a series of figures and vehicles that were in development but never saw final production. Up first– the much lamented G.I. Joe: Renegades ANIMATED figures. Some of these are pretty close to what actually hit shelves (Tunnel Rat, Scarlet, Ripcord) but some of these are pretty radically different. The less I say about the reveal of the Coyote the better– otherwise you’ll see a grown admin cry.